Will the government really be able to stop using hotels to house the homeless by next year? The Housing Action Plan states that hotels will no longer used by next year, but is that possible? 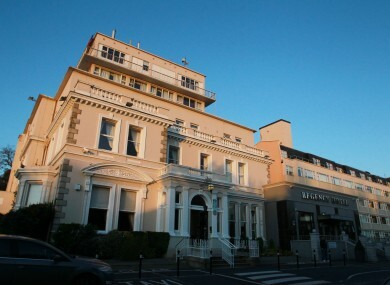 The Regency Hotel in Dublin that's used partly to house homeless families. “It’s awful, it’s very, very stressful. I’m washing [my baby's] bottle in bathroom water. “She’s got a bad dose of thrush twice since being here because it’s not suitable water. It’s very bad for us financially too because we have to eat out everyday. I go days sometimes skipping meals. The mother’s account was just one of many similar accounts heard over the past few years of parents living in cramped, unsuitable accommodation with their families for long periods of time. Earlier in the week the Housing Action Plan was launched to much fanfare, as the government moves to address one of the most prominent social issues of the past number of years. Entitled Rebuilding Ireland, the 114-page document contains multiple provisions to address the housing crisis in Ireland. Activists and residents at the hotel n Dublin during the week. The plan has an entire section dedicated to addressing homelessness in Ireland, with one of the key areas of focus being the number of homeless families currently living in private hotels of B&Bs. The document states that by mid-2017, hotels will only be used as emergency accommodation in limited circumstances. Our intention is to move the existing group of families out of these hotel arrangements as quickly as possible, and to limit the extent to which such accommodation has to be used for new presentations. Our aim is that by mid-2017, hotels will only be used for emergency accommodation in very limited circumstances. The use of hotels to house homeless people began to increase significantly in 2014, as existing services struggled to cope with the rising numbers. As prices rose in the private rental market and supply dwindled, the number of families presenting as homeless began to increase as the number of families leaving homelessness decreased. This led to a clog in existing accommodation services, which weren’t equipped to deal with the number of people now presenting. There are a very small amount of homeless shelters in Ireland that are purpose built for housing families. Typically, homeless families would be sheltered in “B&Bs” – privately owned places of residence that local authorities (like Dublin City Council) would lease out on a permanent basis. “When the crisis started to get worse about three years ago and these all filled up, they started using hotels to house people,” Mike Allen, director of advocacy with Focus Ireland, told TheJournal.ie. Environment Department figures show that there were 344 homeless families living in emergency accommodation in July 2014. By this time last year, that number had nearly doubled to 657. As the numbers kept rising, local authorities had no choice but keep checking families into hotels, putting a huge strain on their finances. “Now they’ve got long-term arrangements with hotels where they block book rooms to get better prices,” said Allen. The problem was felt most acutely in the Dublin region, which contains the vast bulk of the homeless population. In April 2014 there were 184 families residing in commercial hotels in the Dublin region. Latest figures for this year (June), show that that number has nearly quadrupled to 682 families. What was meant to be a temporary measure became a long-term reality for many families – living in a lot of cases for months or years in cramped conditions with no access to proper cooking or cleaning facilities. “I think there’s unanimous agreement in Ireland that this isn’t a good solution,” said Allen. The Housing Action Plan aims to all but end the use of hotels by next year through a number of measures involving building and acquiring new houses and increased rental support schemes. An expanded rapid-build housing programme (which aims to deliver 1,500 units). A Housing Agency initiative to acquire vacant houses (which aims to deliver 1,600 units). Rapid-Build Housing was first floated last year as a quick and relatively inexpensive way to address the homelessness crisis through building modular homes. Modular homes can take a number of different forms, but are based around the principle of ‘stacking’ individual modules together to form a house. This means they can be produced off-site in factory conditions, and quickly assembled on-site. Criticism over the cost-effectiveness of modular housing and how long the units will last has arisen since they were first announced. Despite commitments last September to build 500 modular housing units, to date just 22 have been built at a site in Poppintree, Ballymun in north Dublin. RTÉ reported in March that in total these units cost about €4.2 million to build, putting the cost of each unit at about €190,000. Despite this, the Action Plan states that 200 units will be built by the end of the year, 800 by the end of 2017 and another 500 in 2018. “They have a credibility problem in terms of delivering rapid-build housing,” said Mike Allen. We don’t have any evidence to believe that they can deliver it this time. There is no mention in the plan of how any of the issues that face the previous rapid-build housing programme will be addressed in the next build. The second part of the plan to end the use of commercial hotels involves housing agencies acquiring vacant properties to be used as social housing. The Housing Agency is a government body set up to support housing functions in local authorities and the Environment Department. The Action Plan states that the agency will immediately begin acquiring vacant homes from the investment or loan portfolios of banks and other financial institutions to be used as social housing. This will deliver 1,600 new housing units by 2020, the plan states, and alleviate the need to use hotels forms of accommodation for families. “It’s very clear in the report that they will only be buying these housing units if they’re empty,” said Mike Allen. In our experience, when we’ve looked at buildings which are owned by financial institutions they are not empty, they have leased them out. Allen said that problems could arise out of the houses being occupied, but that the plan to acquire the units had been thought out. “It’s not just made up, there is a definite plan there,” he said. However, while he commends parts of the plan, Allen questions the timeline of getting the families out of hotel accommodation by next year. Another aspect of it is the use of the Housing Assistance Payment (HAP), which is paid on behalf on tenants to landlords. The plan states that this will be used to move families out of homeless accommodation and into private rental accommodation. However, while Allen states that this has helped get homeless for people, the success of the measure relies on the supply of houses being there. If there aren’t enough houses available, it will be impossible to move people. “It’s not just a question of price, it’s also a question of whether these units actually exist.” he said. It’s very to see all those bits adding up in time. Let’s hope they do. But when you look at the figures they’re pointing in the right direction to tell you that that can’t actually be achieved. Email “Will the government really be able to stop using hotels to house the homeless by next year?”. Feedback on “Will the government really be able to stop using hotels to house the homeless by next year?”.